Head of Italian workshop Matteucci Garage, Marco Matteucci, is adamant he’s not a mechanic. ‘I’m not even close, I wouldn’t offend the category’ he insists. Instead he comes to motorcycles from a different background, as a graphic designer and advertising photographer with over 20 years experience in the industry. 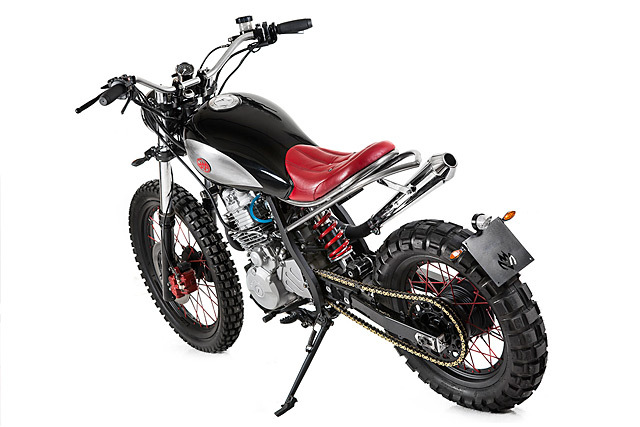 And it shows, with an impressive attention to detail and immaculate fit and finish on his latest build, a Honda XL600 LM he’s dubbed ‘True Blood’. While he may not be a mechanic, Marco certainly built one of the most head-turning builds Pipeburn has featured this year. Marco had been riding motorcycles for years, cycling through a host of stock factory bikes to get him around. And that was the extent of the relationship with his machines. ‘It was enough to turn the key and press a button… and for everything else there was a workshop.’ But in a moment of revelation when he realized he didn’t even know how to change the oil, let alone undertake some basic customization, he set about to try and learn a little more. 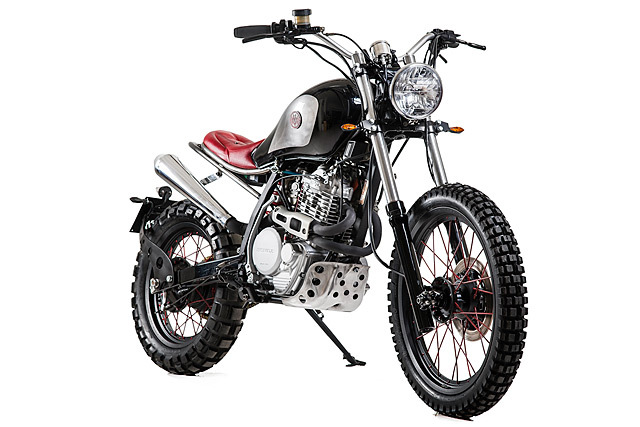 And in a more dramatic way than most – he went into a local dealership and picked up three run-down motorcycles, a Moto Guzzi V35 Imola, Suzuki GS550 and Yamaha XJ550. That was 2013, only two years ago. After a few months of hard work and eventually, a carefully orchestrated photoshoot, Matteucci Garage had a troika of café racers in his workshop. And he didn’t waste any time before rolling out some more creations, each better built than the last and each featuring deftly selected colour palettes. While Marco doesn’t have a wealth of experience with bikes, he’s not short on vision. 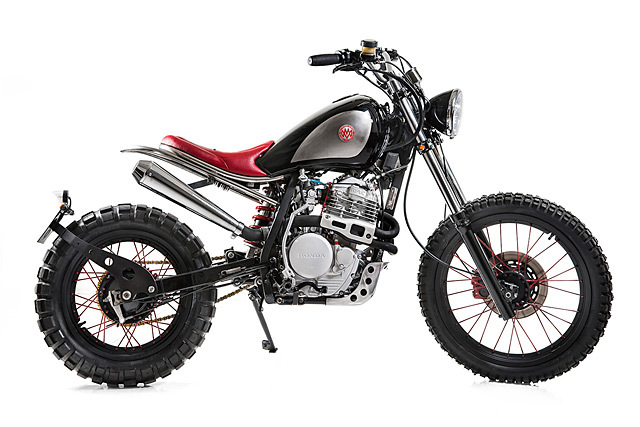 When he first picked up his most recent project, the old Honda XL Dakar bike, he already knew what he wanted to do, something other than the café racer styled rides he’s produced before. ‘I wanted to create a different bike. Unconventional, with soft and light lines but aggressive and raw at the same time’. And unlike many builders who can wax lyrical about their aims, with Marco I can see exactly what he’s saying and that he’s also knocked it right out of the park. While details about the build are a bit thin on the ground at the moment, a few things can be gleaned about the work Matteucci Garage have undertaken. 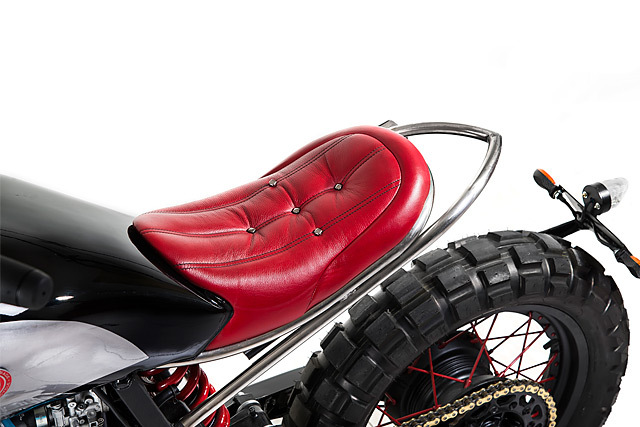 The bike has been stripped of all its plastic, its twin headlight assembly has been removed and the subframe has been heavily modified, running short and mounting a curved, aged red-leather seat buttoned like a Chesterfield couch. 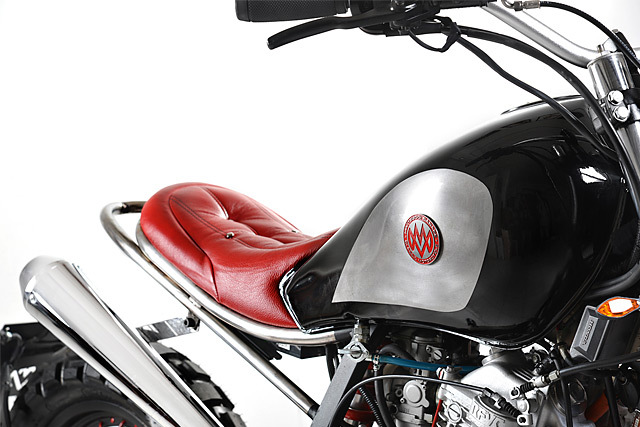 The leather on the seat and the brushed steel finish on the side of the tank give the old Honda a tactile feeling that’s hard to find on many custom bikes. And in a twist that I’m sure will please even some of the most grumbling Pipeburn readers, ‘True Blood’ runs indicators at the front and rear. While it’s true that Marco isn’t a mechanic, these days that means little in of itself. Modern mechanics can often slumber through their entire career just doing scheduled servicing on modern bikes and never produce anything of the level that he has. 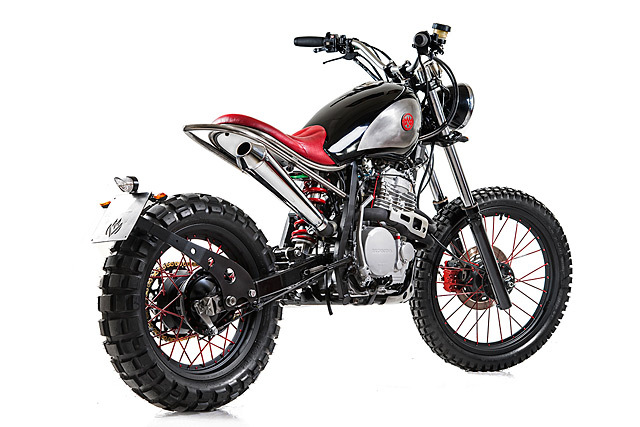 In only two years Marco has shown us all that building a show-stopping bike isn’t just the cumulative effect of time spent dropping oil on a near-new motorcycle, or even a wealth of experience blinking at a MIG arc. It’s about passion, vision and attention to detail. We’ve all got no excuses now.